Installing an Ariston electric mini-tank water heater under the sink puts hot water right where you need it -- at the point of use. Easy installation. Simply tap into the cold water line and install the water heater directly at the sink. The glass-lined tank ensures long life, and the superior insulation provides quick recovery and greater energy efficiency. Plugs directly into a standard 120 volt outlet. And when you want to eliminate the wait for hot water but need more volume, install the Ariston water heater in-line with a larger hot water source. The Bosch Tronic 3000T ES2.5 (Ariston GL2.5S) keeps 2.75 gallons of hot water ready to go and draws only 12.5AMPS. A Pressure relief valve is included. The Bosch Tronic 3000T ES2.5 is the direct replacement for the Ariston GL2.5S and is also the replacement for the Ariston GL2.5, but please note that the Bosch Tronic 3000T ES2.5 (Ariston GL2.5S) is 10.75" deep while the Ariston GL2.5 was only 10.25" deep. The new Bosch Tronic 3000T ES2.5 (Ariston GL2.5S) has many improvements over the older Ariston GL2.5. 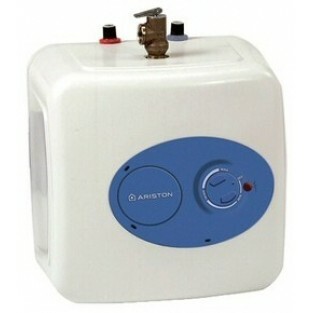 The Bosch Tronic 3000T ES2.5 (Ariston GL2.5S) has a new temperature adjustment knob on the front of the unit to raise and lower the temperature from 65 Deg F to 145 Deg F while on the older Ariston GL2.5 you would have had to remove the blue oval cover to access the temperature control knob. The Bosch Tronic 3000T ES2.5 (Ariston GL2.5S) also has a new improved thermostat that features a new sensing probe that is attached to the thermostat and inserts into the cavity of the new element so the heater can adjust temperatures quicker and maintain a more consistent heat. 6-year limited warranty on inner tank; 1 year limited warranty on any component part other than inner tank. LIMITED 10 YEAR WARRANTY COVERAGE BOSCH THERMOTECHNOLOGY CORP. FOR POWERSTREAM PRO RP17PT and RP27PT. LIMITED 5 YEAR WARRANTY COVERAGE BOSCH THERMOTECHNOLOGY CORP. FOR POWERSTREAM PRO RP POINT-OF-USE SERIES guarantees this water heater to the original owner of the water heater at the original installation location against defects in material and workmanship for the periods specified below.